You’ll have instant “pre-cost” information based on your most current food costs. No more guesswork, no more surprise food cost fluctuations. Standardized recipes mean greater consistency, better food costs, and more satisfied customers. Re-work your current recipe and develop new concepts in a snap! directly from your inventory items. Price changes update recipes instantly! 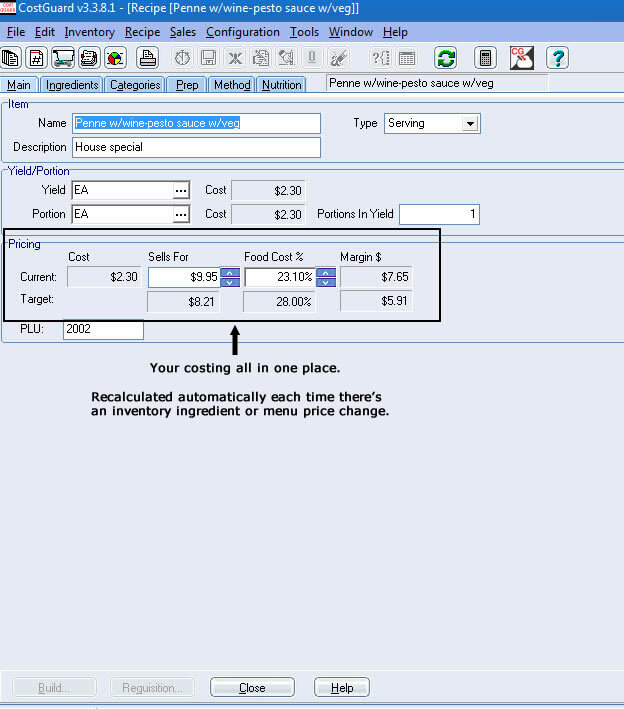 Or change your selling price to manage your food cost percentage and margins. 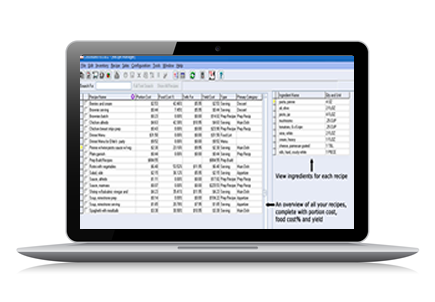 converts recipes to larger and smaller yields and also converts units intelligently. 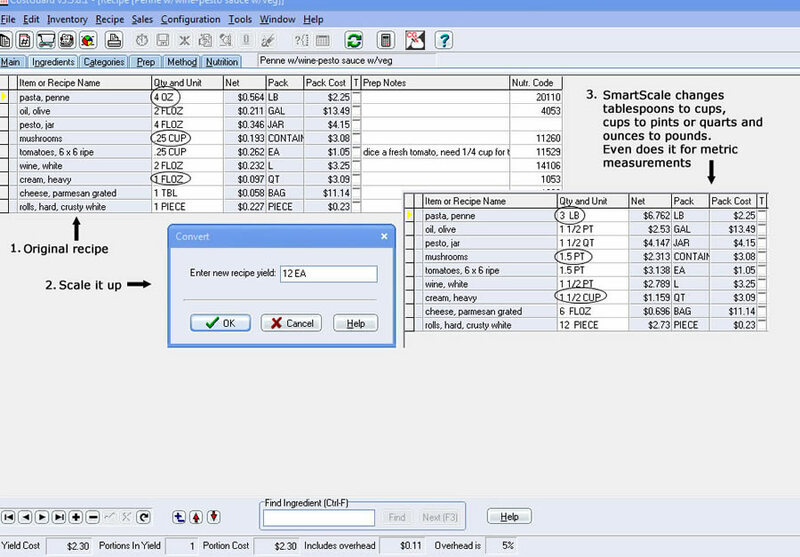 Ounces are changed to pounds, teaspoons to tablespoons to cups to pints to quarts automatically. Using metric weights? No problem, CostGuard has built in metric conversions. 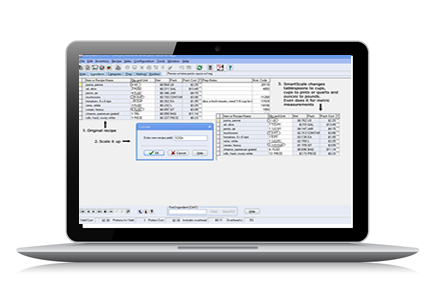 Overhead is automatically calculated and added to your food costs. 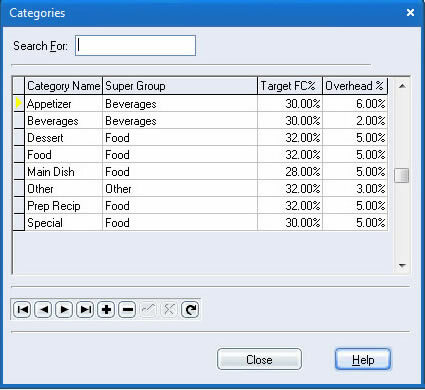 Additionally, target your inventory items by groups which allows you to cost your food, beverages and supplies separately. to easily distribute new concepts to other units. You can use the recipe Import feature to copy recipes from another unit. 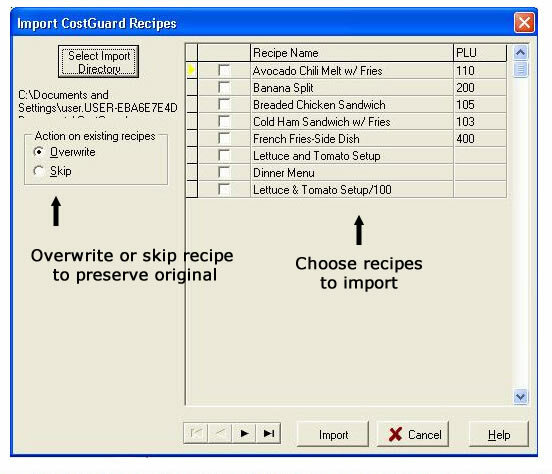 This import lets you select the recipes that you want to import with a skip function so that recipes and ingredients are not overwritten. The Recipe Manager Import will also bring the ingredient information with the recipes, making it very easy to select certain recipes and have the ingredients follow. 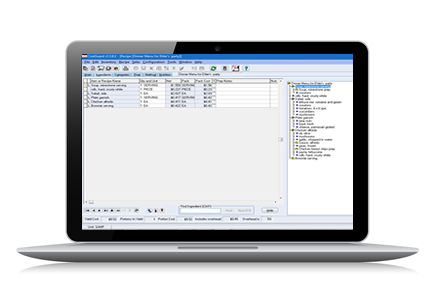 Importing Recipes is ideal for chain operations to update unit recipe files. (shopping list) that automatically generates production sheets, prep lists, orders, etc. Pricing, and standardizing. 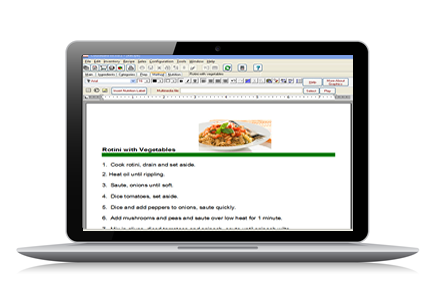 There’s no limit to the number of items and sub-recipes per recipe you can link together to create menus. 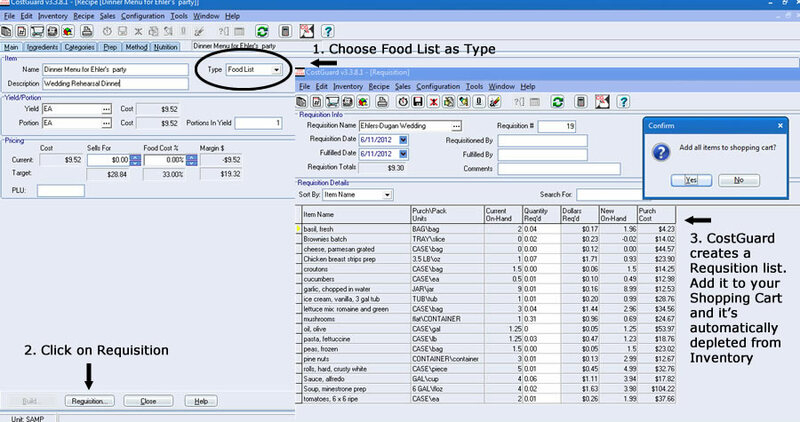 Menus can be passed to Requisition feature, added to Food List (shopping cart) and depleted from inventory when used with the POS Interface. The same item might be packed differently either by the same or different suppliers. You may get sugar in a 50 lb bag in one order and sugar in 2 25 lb bags at a different price in another. Without the substiution feature you’d have to edit EVERY SINGLE RECIPE containing sugar by hand whenever the item changed. There are other times this may happen, seasonal fluctuations mean switching fresh for frozen, items gone bad mean substituting with others on hand, sometimes you may be substituting home made for prepared. Each of these examples may mean a price change that ripples through every recipe. 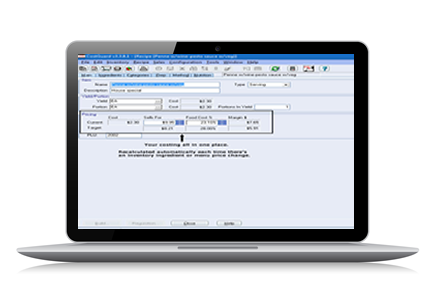 Now it’s as simple as telling CostGuard to do the substutition for you. 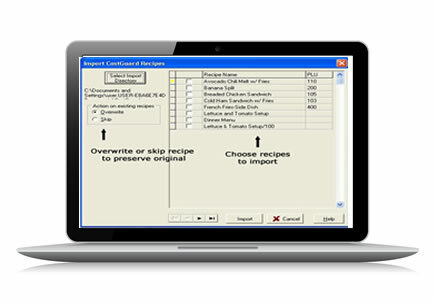 Prep Build allows you to maintain perpetual inventory for recipes that you prepare in bulk. How easy life in the kitchen would be if all ingredients came ready to use with no trimming, waste, shrinkage or expansion to worry about. Since that is not the case, CostGuard helps you with these tedious calculations. AP (As Purchased) is how most items are bought. •Your case of lettuce weighed 50 pounds when it arrived, after you cut off the outer leaves and core, you have 35 pounds left. •Your beef ribeye roast was 22 pounds when delivered, but after you cut off the extra fat, you had 19 pounds left. •Your raw turkey breast weighed 8 pounds before it went into the oven, now after it came out, it weighs 6 ½ pounds. •From your cooked turkey breast, you sliced 100 1-oz portions. Somehow, you “lost” 4 oz in the slicing. 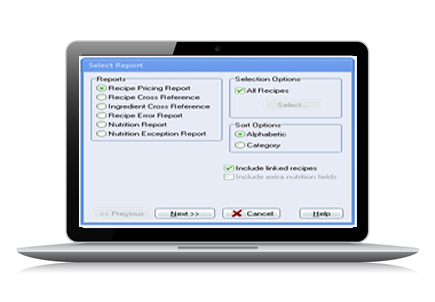 You are now using this information to cost out your recipes and menus accurately. 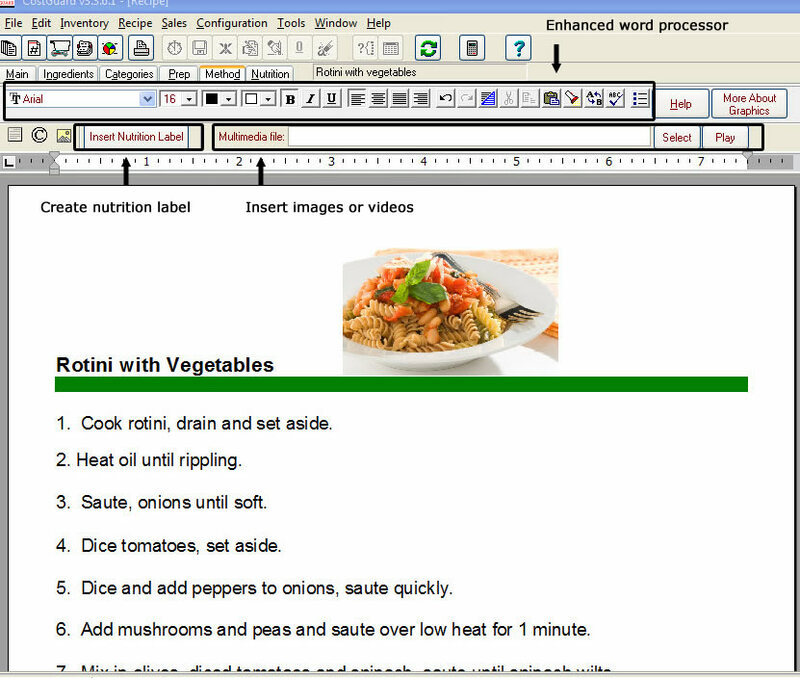 And, since CostGuard calculates shrinkage for each recipe unit, you can manipulate your usage. 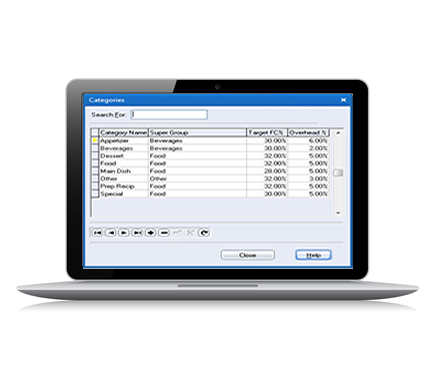 CostGuard allows you to set up several different units for the same item, each with their own shrinkage rate. for stylized entry of your recipe method (instructions). You can update, also includes many culinary terms. from scanners, digital cameras, VCR’s, clip art, etc. 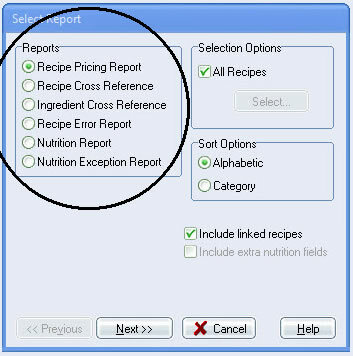 Recipe Pricing, Ingredient Cross Reference, Recipe Cross Reference. 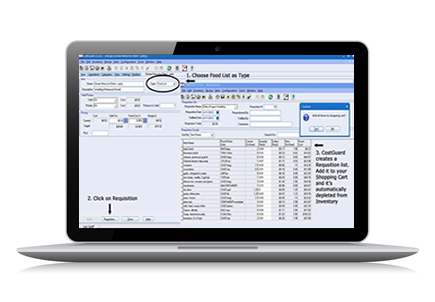 Search recipes and print reports using your own customized categories. 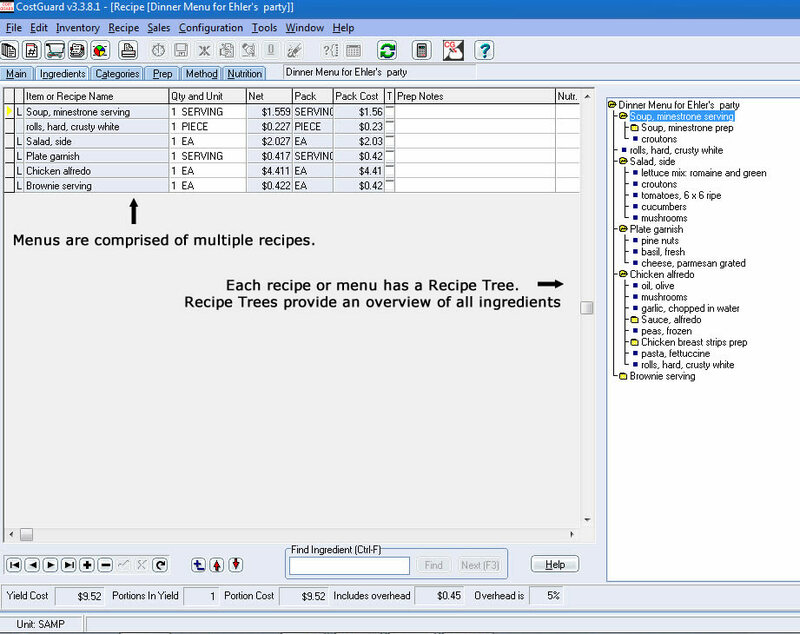 Print recipe with or without prices; a visual “recipe tree” for drilling down through any recipe.